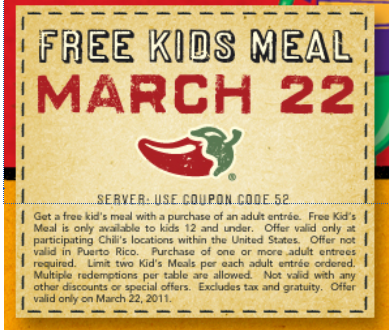 Chili’s Bar and Grill is letting your Kids Eat Free with any adult entree on Tuesday, March 29, 2011,. Just print this coupon and take it with you. Before you go, don’t forget to print your Free Queso and Chips Coupon. Many locations will allow you to use both coupons, but be sure to ask your server before you order. If you haven’t already, sign up now and you will receive a coupon for a Free Queso and Chips when you sign up for the Free Chili’s Email Newsletter. Why does the coupon say March 22 if the kids meals are free on the 29th?